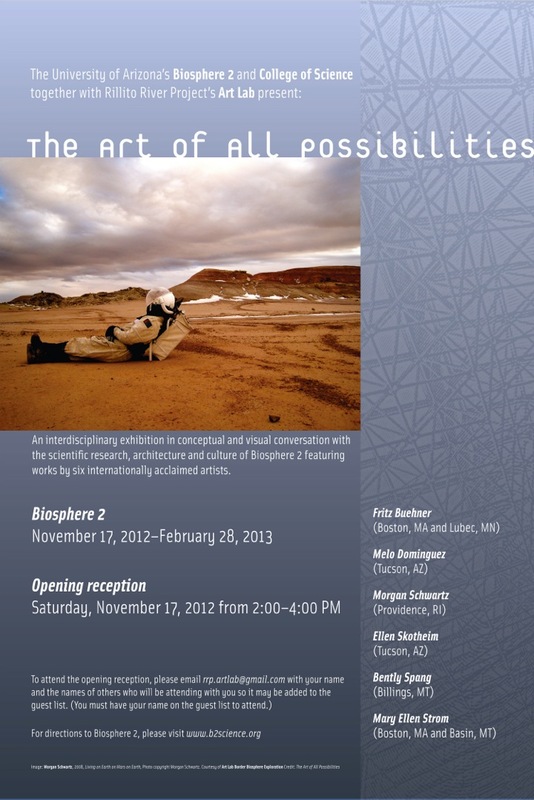 The University of Arizona Biosphere 2, The University of Arizona College of Science and Rillito River Project’s Art Lab present the exhibition The Art of All Possibilities at Biosphere 2, November 17, 2012 – February 28, 2013. 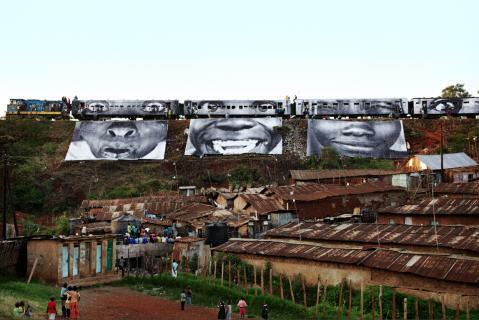 The opening reception is Saturday, November 17th at 2:00 p.m. The Art of All Possibilities is an interdisciplinary exhibition in conceptual and visual conversation with the scientific research, architecture and culture of Biosphere 2. The exhibition will open on November 17, 2012 and will feature works by internationally acclaimed artists Fritz Buehner (Boston, MA and Lubec, MN), Melo Dominguez (Tucson, AZ), Morgan Schwartz (Providence, RI), Ellen Skotheim (Tucson, AZ), Bently Spang (Billings, MT) and Mary Ellen Strom, (Boston, MA and Basin, MT). The artists’ projects will be installed at numerous sites in Biosphere 2 from the desert to the lung and will include video projections, sound works, sculpture and performance. The exhibition’s title borrows from the name of the theater group that inhabited Biosphere 2’s first mission in 1991, “The Theater of All Possibilities”. Art Lab Border Biosphere Exploration was founded through the Rillito River Project to bring together leading artists and educators with scientists and researchers to explore the Sonoran Desert Bioregion and be inspired by the unique environment that surrounds them at the Biosphere 2 and Tumamoc Hill Research Station in Tucson, Arizona, and Cuenca los Ojos’ El Coronado Ranch in Pearce, Arizona. Artist participants learn about how climate change is impacting the environment along the international border region of Southern Arizona, and they create artwork in response. Their work is then presented on the Rillito River Project website, www.RillitoRiverProject.org and in related exhibits and presentations. The University of Arizona Biosphere 2 mission is to advance our understanding of the natural and man-made environment through unique experimentation, the training of interdisciplinary scientists, the education of society, and the organization of meetings to address grand challenges that affect the quality of life and the understanding of our place in the universe. For more information on Biosphere 2 and directions on how to get there, please visit www.b2science.org. If you are interested in web design, video editing and photoshopping, then you might be interested in learning about some handy applications which could help to enhance your work. Apps are a great way to keep your creative ideas flowing wherever you might be. Just because you are out and about doesn't mean that you have to stop doing the things you enjoy, from browsing blogs to reading up on the latest photography news. The advantage of having a modern phone or a netbook is that even if you are out for the day, you can still link up to the web and visit your favorite site, whether it's http://www.partypoker.com/ or simply jot your creative thoughts and ideas down in a mind mapping application. This blog post will have a look at some useful iPhone apps which you might find handy when you are out and about. There is nothing more frustrating than having a great idea, but not having a pen and pad at hand. However, Freeform is a great application which allows you to map out your thought process using colored boxes and lines. You can insert photos and text which means you will never have to worry about having to remember your idea until you get home. This handy application allows you to edit photos which you may have taken on your phone, but now you want to incorporate into your website or in a project. The app can enhance the photo's saturation, definition, contrast and much more, allowing you to create the perfect photo. This is a great app for the iPhone from the photo editing giant Photoshop. It allows you to edit photos easily and quickly. Click here to get the app. This app is mainly for fun and it makes your iPhone feel much more like a polaroid camera. For $0.99 this is a great app. Click here to get the app. Every artist needs a good painting app. Brushes is so professional, it was used to create the cover of an issue of The New Yorker. Brushes contains powerful and useful tools designed perfectly for your fingers. Why It's Great: With many fun filters and effects to choose from, it's easy to get experimental and create super cool shots. Whether you're a digital artist or just aspire to be, check out Sketchbook Pro. It's been called one of Wired magazine's "5 Must-Have iPad Apps" for good reason. Choose from high quality digital pencils, pens, markers and airbrushes, and then use the multi-touch interface to create your own, beautiful work of art. The app comes with 60 preset brushes with the ability to install 90 additional brushes and stamp brushes from the store. In the world of Antograph, your finger releases a special "chemical" that tells virtual ants just where to go. Including elements of gaming and motion, the app takes you sweet creation to its logical conclusion, as ants invade the lines of your work. Before you even pick out which art or design app you're going to buy, you may want to download an app that helps you collect your thoughts. Penultimate is a handwriting app that will help you quickly jot down your ideas or sketch out your designs. Choose between three different photorealistic paper styles or import an image to create your own template. Moritz Freyer, Fabian Steiner, Florian Smolka and Lucas Reiner created a POV history of video games.